Here`s our Top 10 Things to Do on Boca Grande. What would a top 10 list of things to do on Boca Grande be without our fabulous beaches. Gasparilla Island has some of the finest beaches in Florida, heck some of the finest beaches in the world. Couple things to be aware of- there are NO lifeguards are on our beaches, please swim at your own risk. There are certain beach areas prone to rip currents, it is also advised not to swim in Boca Grande Pass at the south end of the island. There are plenty of sunny spots on the west side of the island. Please be aware of the waters as we do have marine life such as jellyfish, sting rays, and sharks. It is also a good idea to wear sunscreen, Florida is hot and the sun can burn you quickly, don`t ruin your vacation at the first trip to the beach. Florida also is known as the lightning capital of the world, be aware of afternoon thunderstorms, especially in the summer. We want everyone to continue enjoying our local beaches, please leave only footprints in the sand. Beaches are beautiful, but not when covered with garbage, please take your trash with you, or to an appropriate waste container. Boca Grande has plenty of spots to visit the beach. Starting at 19th St. south there is limited street parking at the end of the roads. You can pull in and park on the side on the road. Some of the streets offer more parking than others. 5th Street has a large parking lot just as you get into the north end of town. The state parks are located on the south end of the island, they do have fees to park your car, so bring some cash. We also have a beach guide on our website. The village of Boca Grande is a great way to spend a day. The historic village was named to the National Register of Historic Places in 2008. This historic beach town features many unique and specialty shops, fine dining, friendly�people and plenty of local history. Stop for a coffee at the Inn Bakery or enjoy some ice cream from the Pink Pony. Park Ave is the main drag through town, with most everything within a few blocks. While checking out the island see if you can find Sam Murphy Park. I`ll give you a hint.. It`s in the historic district, and features a beautiful fountain. Boca Grande got it start as a phosphate mining hub. This quiet island became a major industrial hub, but the larger ports around Tampa offered more space so Boca Grande went back to offering its natural beauty. There are remains all over the island reminiscent of Boca Grande`s past. The current bike and golf cart path were actually the railroad tracks. The historic 2-story train depot located at 4th and Park has been transformed to a mixed use building with several shops and boutiques after the last train left Boca Grande in 1981. Oil docks and the remains of the phosphate docs are still visible from the southern tip of the island, in fact- A new residential development Hill Tide Estates will repurpose those old oil docks into a pier for its residents. Boca Grande Pass is known as the tarpon capital of the world. In fact, every year anglers from across the globe come to this are to fish in the World`s Richest Tarpon Tournament. Tarpon are strictly catch and release. Known for their lasting fight the tarpon are tireless and can take over an hour to fight the Silver King. The Boca Grande Pass is the deepest natural inlet on the Gulf side of Florida with depths of 80`. Thousands of tarpon invade the area waters from April to August. The tides of the Pass keep a consistent flow of food for the tarpon that keep these game fish coming back year after year. The area around Gasparilla Island also has great back water fishing with plenty of redfish, snook, and sea trout. Known as the flats, the shallow waters are filled with sea grass making a perfect environment for marine life to live. In fact, Charlotte Harbor has over 100 protected miles for anglers to explore. Keep in mind you will need a fishing license, there are separate licensing for fresh and saltwater. More information can be found at www.myfwc.com We can help you set up your fishing trips at Gasparilla Outfitters, as they offer a variety of trips with professional guides to fit your fishing preference. Comes in at number 4 of Gasparilla Vacations top 10 things to do on Boca Grande. Gasparilla Island actually has two lighthouses, the Range Light, and the Boca Grande Lighthouse. As you head south out of town, the 100` range light is tough to miss, brought to the island in 1920 and assembled on site, it is still used for navigation today. The range light has recently undergone a major restoration and now offers climbs up to the top and other activities. The crown jewel of Boca Grande is at the end of the island and is the Port Boca Grande Lighthouse and Museum. Located in Gasparilla Island state park. Originally known as the Gasparilla Island Light Station, the Port Boca Grande Lighthouse is the oldest structure on the island and has been a beacon to mariners since 1890. The house-dwelling style lighthouse is home to a comprehensive museum that opened in 1999. All proceeds from the gift shop and donations to the museum directly support the lighthouse, our local state parks, as well as our educational programs. Half way through our top 10 things to do on Boca Grande. We come to the Gasparilla Inn, located at 5th and Palm Ave. The Inn is one of the largest and oldest resort hotels in Florida. A true old Florida resort built in 1913, this historic landmark has hosted famed guests such as J.P. Morgan, Henry duPont, and more recently the Bush Family. On March 18, 2008, the Inn was added to the U.S. National Register of Historic Places. The Gasparilla Inn is definitely a place to stop in and enjoy this historic hotel. Sorry golfers, the Inn`s golf course is unfortunately only open to Inn guests. It should be called 2nd street, but the amazing trees planted in 1915 by the builder of the Gasparilla Inn deserve the rename. The shaded canopy is the perfect backdrop for photos and is also a popular wedding venue. Most days you will find folks taking pictures and climbing around the large rooted Banyan trees. You will also see several carvings into the trees, please don`t continue this. It damages these magnificent trees, and takes away from their beauty. During Hurricane Charley one tree was knocked down, but thanks to the quick work of the recovery teams the tree was re-planted and has since recovered. 7. Rent a Golf Cart- Travel the island like a Boca local! Boca Grande`s primary and most popular form of transportation on the island. You can travel to and from most of the island on the cart paths. In season, downtown sees lots of cart traffic on the roads. While carting you have to obey the same rules as if you were driving. It does get a bit crowded downtown, so be careful! A few tips. Try to park in a way that you can share a parking space with another cart, two carts can fit in one parking spot. Watch for people walking when backing up. Bumping into someone with your cart hurts! It`s common for people to mistake one cart for another, as many of the rental carts look the same. Please take your key with you while parked. We have a guide on our website with the island carting rules. Boca Grande seems as if it was made for bicycles, therefore it makes our top 10 things to do on Boca Grande. There are almost 7 miles of bike paths on the island to explore. Offering scenic views of the bayou, native flora, wildlife, the historic business district, Range Light, and the beaches. The bike path was created in 1983 from the old railroad tracks that hauled phosphate to the docs at the southernmost tip of the island to Arcadia. The bike paths are best suited for leisurely pedaling. Most of the riders you will find are people relaxing on a beach cruiser, but if you are a true bicyclist and have the need for speed, you can ride on the streets just as in other areas. Number 9 on our top 10 things to do on Boca Grande. This little slice of island paradise has some of nature`s special creatures. With the island having many conservation acres local wildlife is plentiful. Be on the lookout for Osprey, they are large bird of prey with wings spanning 5`! Also, look for White Pelicans, they are often found on the north side of the island, and even iguanas! These non-native species are actually destructive to the island, and in fact we have an iguana trapper. Keep an eye out for George, a man in bright green shirt on a golf cart with iguana control. Ok, Ok, yes I added a 1/2 to the top 10 things to do on Boca Grande, but believe me, it`s worth it to do some back water explorations. With Charlotte Harbor directly on our east side this area is a perfect backdrop to explore this waterway in a kayak or paddleboard. 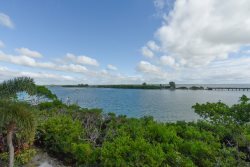 There are miles of shoreline, and mangroves to enjoy. See dolphins and manatees in their natural environment. Click for our site with kayak and bike rental options. This is definitely a top 10 things to do on Boca Grande. Finally #10 on our top 10 things to do on Boca Grande. Locals say that this area is layed back to the horizontal. We really like our small beach town atmosphere, no traffic lights, no chain restaurants. Heck! Boca Grande doesn`t even have a gas station! Just some of the best beach livin` around. We hope you will enjoy our little historic town, and experience the top 10 things to do on Boca Grande.